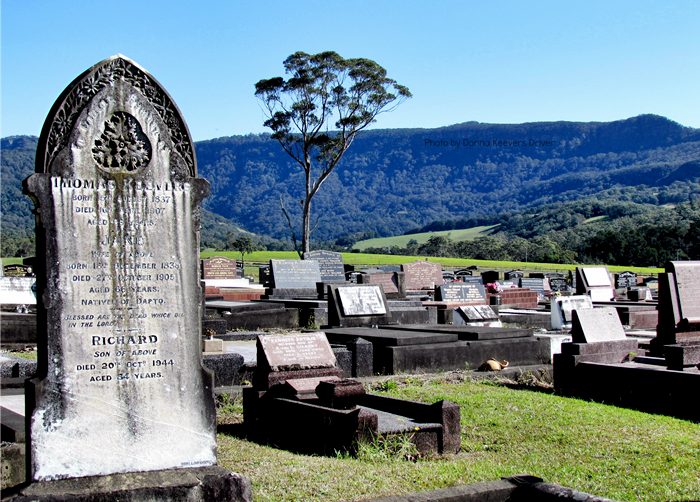 I took this photo while wandering an aged graveyard at Jamberoo, NSW, Australia. I was actually searching for the graves of my first Australian ancestors but didn't find them. The Keevers' buried here are descendants of my first Australian ancestors, but I never noticed the name on the grave until I was viewing my photos on my computer. I simply took this photo because the headstone stood out against the background you see here, and I simply wanted to capture it. I was both stunned and overjoyed to see KEEVERS etched on the headstone. As a [lay] photographer, I often find myself drawn to aged graveyards. Newer headstones do not have the same "appeal", for I know there are many hearts still living, still beating, that ache over the loss of the loved one buried there and I walk away aching for those left behind. But when it comes to the old graves, such as this one, I often find myself wondering who the person was, what life was like when they walked the earth, what was their favourite way to spend time, and things such as that. It's the photographer in me that draws me to the grave sites, and the writer in me, I guess, that carries me back to times not my own, and the romantic part of my heart that paints a life fit for any soul in the set era of the time of their existence. My husband prefers not to attend graveyards, and I don't blame him. He sees the death, the pain, the loss, and I step beyond and wonder who, when, and where, and that through an awareness of the eternal life, joy and peace that awaits them on the other side of this realm. I confess that I try to avoid strolling through graveyards where I was forced to say goodbye to loved ones. But even with those I've had to say goodbye to I start to wonder who they really were. What were their dreams? Their fears? Their passions? Did they live 'the dream' or was it lost in the palm of reality? What I'm often left with is a greater awareness that we're all human. We were all pushed forth into a world that can, at times, leave us cold and alone and in tears; a world where joy and love and a glorious sunrise can see our soul rejoicing; a world that can, at times, leave us wondering what life is all about. We all experience a broken heart. We all have dreams. We all get knocked down. We all have suffered. We all experience a myriad of emotions through the course of our life... But have you ever wondered what drove 'that person' to be as bitter as she is, as angry as he is, as miserable as they are? Rather than bully, rather than point fingers at, rather than kick while they're down, rather than walk away from, rather than giving up on someone, rather than judging someone, have you ever stopped to wonder who they are, what passions they possess, what broke them, what dreams have been stolen from them, what they were raped of, what hopes they've had dashed...? In the graves above there exists the memories of lives already written. We may be able to go back in time to uncover things they did, and things that happened to them, and so on, but the 'fullstop' has been added to their life. You can still love them, you can still miss them, you can even ask the Big Guy to let them know that you love and miss them, but what of the ones still here? There are people in your neighbourhood, your street, your workplace, your school, your church, your circle of friends, your family, that are as cold and as empty as these headstones... They feel dead. Once, when I was fretting over not being able to help everyone as I wished I could, Jesus tenderly placed on my heart, "I'm the Saviour of the world... not you..." and that released the burden of not being able to help everyone. So I know YOU cannot rescue everyone - or anyone - from every problem that comes to weigh them down, but you can make their life a little easier by remembering that they were born into the same world as you, with hopes and dreams and needs just as you have. You can remind yourself that their anger, their melancholy, their sense of hopelessness, or whatever it is that plagues them and, at times, annoys you about them, was born from the things cast on them during the course of this life, that came to break their hearts. That neighbour, that work colleague, that kid in the playground, that family member, that friend... what broke them? What are their lost dreams? their lost loves? the weight that crushes their heart? On the other side of this life, there is a world we call heaven - a place called Eternity, where we will know great love, great peace, joy, understanding, and all that is good and can no longer be tarnished or stolen by sin... but until then, wouldn't it be great to help lift the weight of misery off a heart still beating...? And, hey, remember, no one is asking you to be anyone's Saviour; no one is suggesting you have the answer to their issues, but you can help a broken soul simply by keeping judgement to yourself sometimes. A simple word, a smile, or a turning of the other cheek, or keeping your mouth shut, even, can very well be the key someone in your world needs to get on the track to having their heart healed and set free so they, too, can love and live to help another hurting soul. 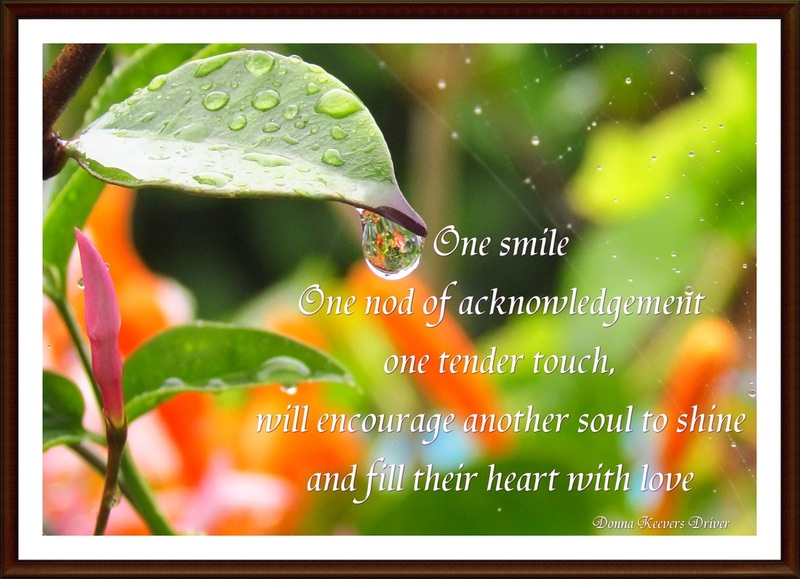 You don't have to be all things to all people... but one touch, or one withheld ounce of anger, can make a huge difference to the heart of the broken soul - and to you, the giver.